Leave Red Lion Square via the west gate, opposite the statue of Fenner Brockway, and turn right. Cross at the traffic lights towards Transport House, turn left and continue across Old Gloucester Street and Southampton Row. Continue along Vernon Place and turn right into Bloomsbury Square. Enter the square via the gate on the left and walk to the central paved plaza. After the Great Fire of London in 1666, wealthy Londoners did not want to return to the crowded, dangerous conditions of the old medieval City. The new estates being built by landowners in the countryside to the west of London offered a new way of life, and became London's first suburbs. The underlying pattern of Bloomsbury, with the diverse shapes and sizes of the squares, can be traced from the fields and closes from which the estate developed. 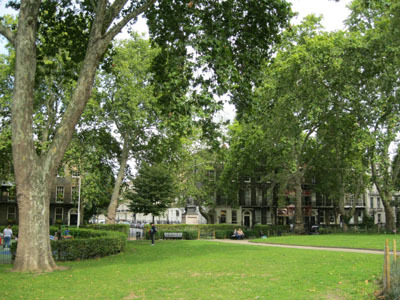 Bloomsbury Square was the centrepiece of the Bloomsbury Estate, which was developed from the 1660s to the 1850s. It was the first square to be called a ‘square’, and was laid out by the 4th Earl of Southampton as the forecourt to his grand London home. If you look to the north, you can see a terrace of Regency houses, built by James Burton, just beyond which the mansion once stood. On the remaining three sides of the square, the Earl sold plots of land to builders on 42-year leases, at rents of around £6 per year, for the construction of what he stipulated must be high-quality housing. Gradually, the up-market houses of the square were surrounded by more modest streets, shops and services, creating a new, self-contained estate for the wealthy classes who flocked to live there. The enterprising Earl's new building-lease system proved very profitable, and was enthusiastically adopted by other aristocrats developing their estates around London. The estate fell into the hands of the dukes of Bedford as a result of Lord William Russell's marriage to the Earl of Southampton's daughter, Lady Rachel, in 1669. Building slowed for the next century, but in 1800 the fifth Duke of Bedford, Francis Russell (1765-1802), was keen to continue development, and he had his mansion torn down to make way for more houses. By 1819, the estate was generating half of the family's considerable income. Originally the garden at the centre of the square was very plain, with grass divided into eight parts by four crossing paths. In 1807 the Duke commissioned leading landscape gardener Humphry Repton (1752-1818) to design a new garden, which he laid out in the high style of the day with curving paths, a formal lime walk and shrubberies. The square remained private, for the use of residents only, right up to the Second World War, when its railings were removed to be melted down for armaments. This allowed other people to come into the square for the first time, and in 1950 it was officially made public. The gardens have recently been restored, combining elements of Repton's design with the earlier 18th-century layout of paths, and a mix of shrubs and herbaceous plants, laid out as they would have been in Regency times. Many rich, famous and influential people have lived in the square over the years. Sir Richard Steele (1672-1729), one of the earliest journalists and an MP, who founded both The Tatler and The Spectator magazines, lived here in the late 17th century. The Arts and Crafts architect Edwin Lutyens (1869-1944) lived here in the early 20th century. Already well-known as a designer of country houses, where he collaborated with the celebrated garden designer Gertrude Jekyll, it was during this time that he received his first major public commission for the buildings at the heart of Hampstead Garden Suburb. Looking across to the west, you can see White Hall, where Dr Robert Willan (1757-1812) lived for the last 12 years of his life. A dermatologist, Willan was the first person to classify diseases of the skin. He was also an advocate of the curative effect of mineral waters, and in 1803 published the luridly-titled Account of the Dreadful Effects of Dram-Drinking. Looking a little further to the left, No. 6 was home to Benjamin Disraeli (1804-1881), who lived here from the age of 13 between 1817 and 1824. Disraeli went on to become the leader of the Tory Party and was Prime Minister twice, as well as a popular novelist. The plaque on the house is dedicated to his father, Isaac, who was also a novelist. The residence of William Murray, Earl of Mansfield (1705-1793), was also once in Bloomsbury Square. During the Gordon Riots of 1780, the Earl's house and precious library were attacked and burned by anti-Catholic rioters. In the subsequent trial of the riot leader, Lord George Gordon, the Earl himself was the judge. He treated the accused so impartially that Gordon was actually acquitted of the charges against him.